First things first; Painter does exactly what it says on the tin. Literally: our review copy of Corel Painter X came in a big paint tin. We got our mitts on the limited-edition version (one of a thousand, apparently) complete with special packaging and a glossy poster. The software's the same whether it comes in a box or a can though, and Painter X is as sure and steady as ever. There aren't too many big surprises to be found in this upgrade. 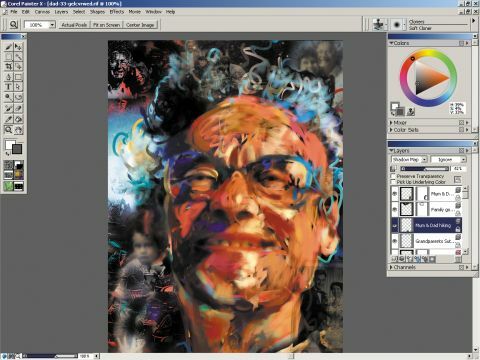 Painter remains the art world's standout natural media software application. The software's schtick is that it enables you to paint with virtual brushes, draw with digital pencils and create pictures with computerised charcoal and chalk. Apart from a distinct lack of fuss and the mess created by art materials, the results are nature-identical. Selected from the application's existing brush list, RealBristle brushes behave like, well, brushes with real bristles. Press too hard and the paint will splay out on the virtual page, while delicate line work is the reward of a lighter hand. Unlike real brushes, you can adjust and customise them on the fly, changing the fanning properties of the brush, the length of the bristles, even their density. You can also pick up multiple colours from Painter's Mixer - an enhanced feature that lets you combine colours on a scratch pad, just like a real painter's palette. Helping you use the brushes is an overhauled cursor that shows a 'ghost' of your brush as you paint. You can see the angle of the brush while you work, helping bridge the gap between graphics tablet and screen. The new brushes can be used whether you're painting manually or autopainting over an existing image. While we're on that subject, there have been some enhancements to the PhotoPainting features, with 'SmartStrokes' using the same directional technology and automatically adjusting to your image. Autopainted images don't particularly turn out like the painterly masterpieces the blurb on the box may lead you to believe you can make, but they do make a great foundation for your own art creations. A new set of layout grids will appeal to true artists, especially the new Divine Proportion feature, famously used by Leonardo Da Vinci when composing the Mona Lisa. Also known as the golden section, it's a mathematical aid to layout that helps you place the focal part of an image in a position that the eye is naturally drawn to. This feature overlays a scalable grid showing the Divine Proportion, enabling you to crop existing images to it or paint new creations and follow it as a guide. Other grids divide the canvas into equal, adjustable sections. Our limited-edition version also came with a handy gadget; a handheld composition guide with the layout grids printed on it, helping you compose a real-life subject. Painter X's interface is classic and remains largely unchanged, with the much-copied colour picker still taking pride of place. In this version though, the workspace is now customisable. Some applications do that by enabling tear-off tabs and workspace saving. Painter X goes a step further; each individual feature on the Brush, Libraries and Portfolios palettes is removable. For example, let's say you use all the paint tools but never touch the pencils or chalks. You can create your own cut-down version of the palette then save it with a custom name for later. You can also create your own custom palettes, adding any commands that are available through the interface. There's plenty of help for new users too. The package comes with a thick printed manual, something that's increasingly rare these days. With video examples to download and access to online tutorials through the application's welcome screen, you won't have any trouble getting started. The limited edition ships with a bonus training DVD too. Artistic talent, unfortunately, is not supplied. Painter's new features may be evolutionary rather than revolutionary, but in combination with the application's solid foundation, Painter X is a powerful upgrade. There's native Windows Vista support on PCs and a Universal Binary version for Intel Macs, plus wider support for new Wacom products. While it's true that you can just about get away with a mouse, Painter really comes alive with a graphics tablet. If you're enticed by the features we've talked about, factor that into your budget when buying the software.